Shin is a young boy on a journey in the Isshu region. When he was younger, he tried going on a journey by himself but found that it was too difficult traveling alone. So, he decided to get a pokemon and become a Pokemon Trainer. Now, Shin travels around with his Pokabu to stop an evil group known as the Plasma-Dan. He is aware that the Plasma-Dan has a "king" and knows that the only way to stop them once and for all is to defeat him. Shin first appears in Volume One, Chapter One. N is a mysterious young man who appears in front of Shin after a battle with the Plasma-Dan. He has the ability to understand pokemon's thoughts. N despises the idea of trainers using pokemon as tools. He constantly questions Shin, wondering how anyone could selfishly force their pokemon to battle, exposing them to danger. 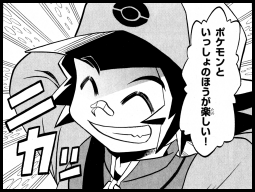 Shin finally gains his respect when he sees that his Pokabu feels as strongly toward its trainer as Shin does for it. 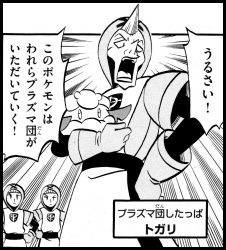 Some of Togari's dialogue suggests that N is the "king" of the Plasma-Dan. N first appears in Volume One, Chapter One. Togari is a member of the Plasma-Dan. His rank is unknown, but he appears with two other grunts who refer to him as senpai (先輩), a term used to refer to people above you in rank. Togari is an oafish bully who believes that the battle prowess he does have makes him invincible. He also has a short temper. 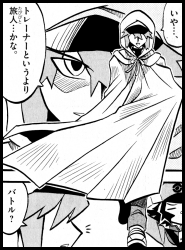 Togari first appears in Volume One, Chapter One.